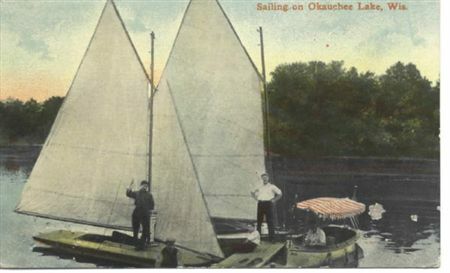 The primary goal of the Okauchee Lake Yacht Club (OLYC) is to promote the sport of sailing and provide a social setting for those with a common interest of Okauchee Lake. OLYC is proud of the long history of developing quality racing fleets and sailors that are recognized as among the best nationally. The core of this goal is met by managing and supporting four primary racing fleets on the lake (C Scows, MC Scows, X Boats, and OPTI's). The Yacht Club also works closely with the Okauchee Lake Sailing School (OLSS) to provide fully staffed sailing classes to our youth sailors. In addition to racing, the club operates a fully functional clubhouse on the north shore of Okauchee Lake that supports social events for its membership throughout the year. OLYC is a volunteer based organization and guided by the Board of Directors who oversee the operation of the club. Contact any of the board members for more information on membership.